Bearing quality metric shafting, in both TGP & Chrome Plated- in stock for immediate shipment! Following chrome plating, the material is precision ground and polished to size - we carry over 50 different metric diameters! Chrome plating prevents surface corrosion while providing additional surface hardness (~60 HRC) and is suitable for various applications including metric pump shafts, metric piston rods and metric hydraulic cylinders. 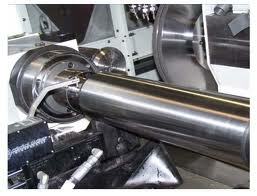 Shafts are readily machinable upon delivery. All metric shafting are delivered machine straightened and stress relieved to remove residual internal stresses. We crate all shafting in custom wood boxes for protection during shipment. 1141 is a medium-carbon steel with higher mechanical properties than other medium carbon steels, as well as free machining properties. Because of the free machining properties, it is usuallly used in automatic screw machines. Applications: pins, studs, bolts, axles and various machine parts needing considerable machining, close finish tolerances, bright finish, and high mechanical properties. 1144 is a medium-carbon steel with higher mechanical properties than other medium carbon steels, as well as free machining properties. Very low distortion or warpage after machining due to a combination of its chemistry, method of manufacture, and heat treatment. Quench & Tempered, Stress Relieved Through Hardened Alloy steel shaft with excellent mechanical properties. 303 is one of the most popular of all the free machining stainless steels. It offers good strength, corrosion resistance and great machinability. One of the most widely used and oldest of the stainless steels. This was originally called 18-8 which stood for its chromium and nickel content. It possesses an excellent combination of strength, corrosion resistance and fabricability. This austenitic stainless steel has an increased molybdenum content to increase its resistance to corrosion when compared to other 300 series alloys. It will resist scaling at temperatures up to 1600 F. Many of our customer use this material for heat treating applications where hot salt solution is used. 316 is also used in the marine industry because of its resistance to corrosion. Heat Treated for increased mechanical properties and hardness.